In 1860, Parker D. Robbins was one of more than 30,000 free blacks living in North Carolina. He was born in Bertie County in 1834. Even though antebellum North Carolina law forbade the education of blacks, Robbins was a literate man. He owned a 102-acre farm and supported himself as a successful carpenter and mechanic. Despite having his freedom and holding property, Robbins faced rigid social and legal restrictions. But events would soon present the opportunity for him to use his knowledge and talents in both war and peace. 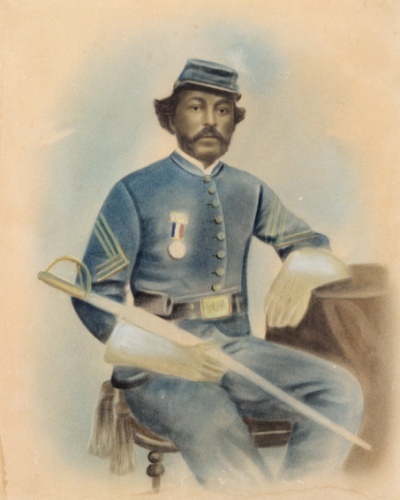 In 1863 he went to Norfolk, Virginia, and enlisted in the 2nd United States Colored Cavalry as a private. Robbins reached the rank of sergeant major in ten days. Following his discharge because of illness, Robbins returned home to Bertie County. In 1868, he became one of fifteen black people elected to the constitutional convention to write a new state constitution. A year later, he was elected to serve in the North Carolina House of Representatives for the 1869-1870 sessions. During Reconstruction he served as postmaster for the town of Harrellsville in Hertford County and obtained several agriculture-related patents. In 1877, with the end of Reconstruction, Robbins resigned as postmaster and moved to Duplin County, where he owned a sawmill and cotton gin. There he built and operated the steamboat Saint Peter on the Cape Fear River. He also used his building skills to construct homes in the community of Magnolia. He died on November 1, 1917, and was buried in Duplin County. Recently, individuals there have worked to bring state and national recognition to Robbins.